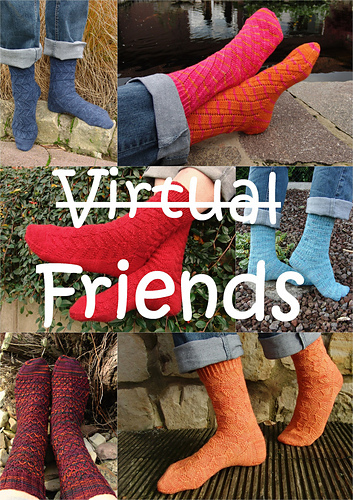 (No longer virtual) Virtual Friends – strange title for a collection you think? The reason is that all patterns in this collection were designed for friends I made online, actually here on Ravelry, and who - after knowing them virtually for a long time – I had the chance to meet in person during our travels in the past few years. As a ‘thank you’ for the wonderful time we spent together, I knitted my (no longer virtual) friends socks and these are the patterns. 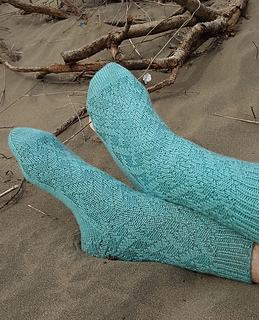 At this time (January 2018) the collection includes 12 sock patterns and I’ve knitted and designed for all my Ravelry friends I had the pleasure to meet during our travles. But who knows? I hope there’ll be more holidays in the future with the option to meet virtual friends, so there might be some more patterns added. If you purchase the collection, you will automatically receive updates of all new patterns when they are released. To avoid any confusion: I’d like to point out that no discounts or credits are given towards the eBook purchase price after purchasing individual patterns. Also, the price for the whole collection might change in the future, depending on the number of patterns included. Many thanks for your understanding.